The Museum of Osteopathic Medicine relies on the support of members to maintain its mission and serve the community. 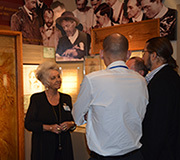 By paying annual dues, members have the satisfaction of helping the Museum continue to grow as a unique source of osteopathic history. Membership is open to anyone interested in supporting the Museum’s mission. Members at the Benefactor and Donor Laureate levels have their names included on a plaque displayed within the Museum.